Better than NEW and move-in-ready! Immaculate and spotless describes this home. All the upgrades one can think of. When you enter you will be captivated with designer colors and features. In the entryway you are greeted with high ceilings, beautiful staircase leading to a loft, 3 bedrooms and 2nd laundry. Highly upgraded gourmet kitchen with 42” maple cabinets/soft close doors and drawers, granite counters, upgraded Kitchen Aid black stainless steel appliances, 36" gas stove top, engineered wood flooring on main level. Kitchen opens to the spacious great room with fireplace and 2 stories of windows. 8' doors lead out to the extended patio. The main level includes office, laundry and master bedroom with custom barn door to master bath. In the basement are 2 more bedrooms and large rec room. 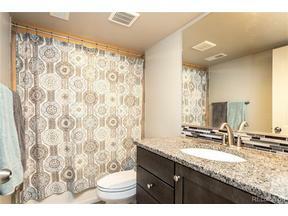 All bathrooms throughout the home have granite and tile. Impeccably designed, this luxurious home is better than new with window treatments and landscaping. Call for complete list of upgrades.